The nineteenth century artist George Scharf spent quite a lot of time at Lord Stanhope's Chevening Estate near Sevenoaks in Kent. The Stanhope's were closely associated both by blood and through marriage with the Pitt family, and in the early 1860s, Philip Henry Stanhope wrote a multi-volume biography of William Pitt the Younger. As a result of these connections, Stanhope had quite a treasure trove of Pitt-related ephemera and portraits at his country residence. Scharf kept sketchbooks of his work, and one in particular is interesting as it features drawings he made both at Cambridge (and Pembroke College, Pitt's alma mater) as well as at the Chevening Estate. 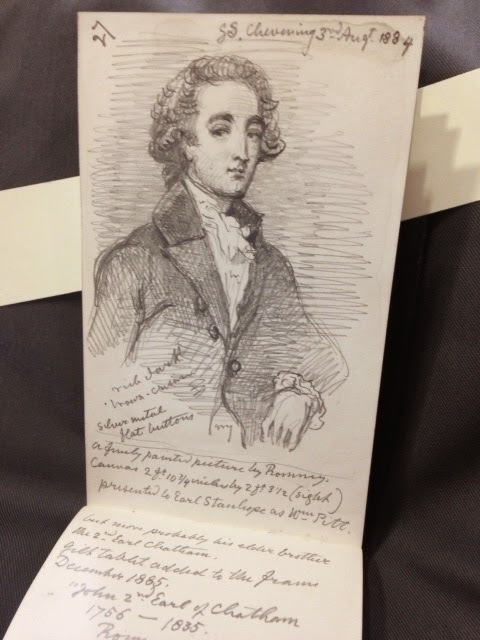 Presumably, someone believed the portrait of the 2nd Earl of Chatham was William Pitt the Younger, and mistakenly thought the 5th Earl Stanhope would like to have at as part of his collection at Chevening. There is certainly a familial resemblance between the two brothers, however their physical differences are marked enough to make it quite clear that this particular Romney portrait is definitely John Pitt and not his younger brother. 1. Heinz Archive & Library. Scharf Sketchbook, 109, (1884-5): NPG 7/3/4/2/124, ff. 26-27.